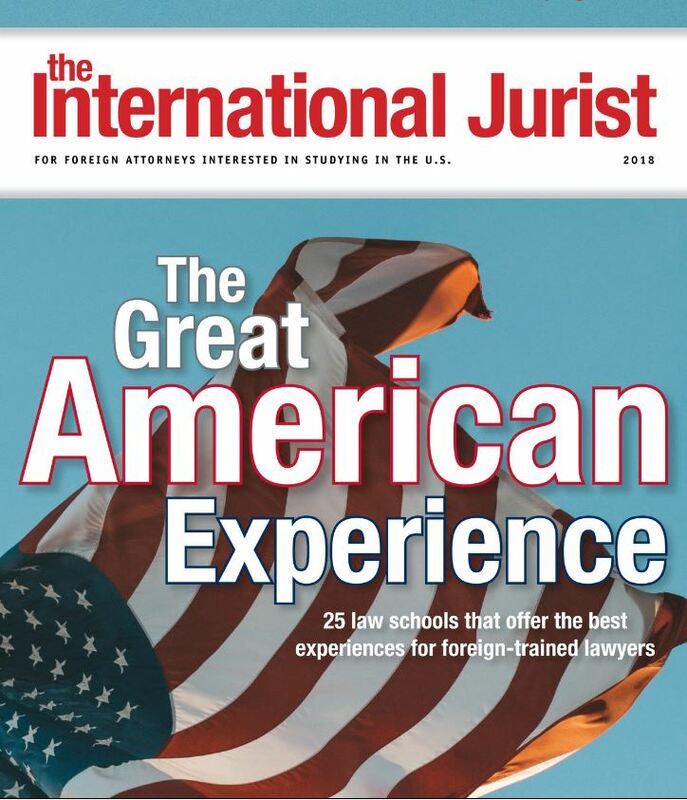 Home Press Releases 2018 June Miami Law Lauded in International Jurist as "Hot Spot for International Law"
The International Jurist cover story, “The Great American Experience” touts Miami Law as one of the “hot spots for international law…and a destination for aspiring international lawyers” in its look at 25 top schools for foreign lawyers. Director of International Programs Carmen Perez-Llorca tells the magazine: “Our faculty and curriculum are a reflection of our location, with a course catalog ranging from International Business Transactions, International Economic Law or International Sales, to International Human Rights or International Criminal Law." Miami Law’s Post-Graduate LL.M. Programs help U.S. and foreign-trained law students and lawyers raise their practice to new heights and deepen specialization. The pivot point between the Americas and Europe and fueled by an influx of international ideas, students gain hands-on learning from the very best industry experts in a city that is a ready-made laboratory for legal training in various fields. Ibrahim Amir, an international student in the LL.M. in International Arbitration program, was profiled in the issue. The Ethiopian national has lived (and worked and studied) on four continents; earning law degrees in Saudi Arabia and Scotland, and internships in Hong Kong and New York. Since he wants to practice international arbitration, Miami Law’s White & Case International Arbitration LL.M. program was “the only one of its kind in the United States and one of the best in the world, if not the best,” Amir told the International Jurist. The top legal education trade publication singled out many of Miami Law’s LL.M. programs, including the LL.M. in Maritime Law, as one of only three programs in the country; the only online LL.M. program in Real Estate Development; and the only U.S. law school with a graduate program in Entertainment, Arts and Sports Law. “Miami Law students also benefit from synergies across LL.M. offerings at the school, such as graduate programs in Taxation of Cross-Border Investments, International Arbitration, and Maritime Law,” said Perez-Llorca. This past May, Miami Law graduated almost 100 LL.M. students, including 31 in International Law, and 12 in International Arbitration.